THE ULTIMATE IN MOISTURE AND/OR ICE CONDITIONED VAPOR INHALATION!!! 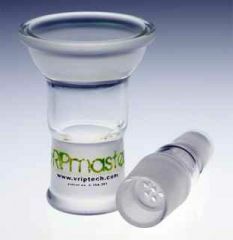 HEAVY WEIGHT PYREX blown into Vapor optimized dimensions featuring a flush mount ground joint "GonG" down stem with 4x4 microjets and a central jet for the perfect amount of vacuum resistance for vaporizing, the VripGrip ice catch, and the super effective U-PerK diffusion chamber for the smoothest vapors and largest enjoyable inhalation potential the world has ever known. Accepts the VCB4.2_14.4mm "GonG" Vaporization Chamber Bowls for use with the VHW or HG heat tools and can also be used with the Valloon VDS_14.4mm for moisture and/or ice conditioned vapor balloon inhalations.